This week it was time to change up the sensory area of my preschool classroom. We had moved on from all of our spider fun (check it out here!) and focusing more on Halloween fun! 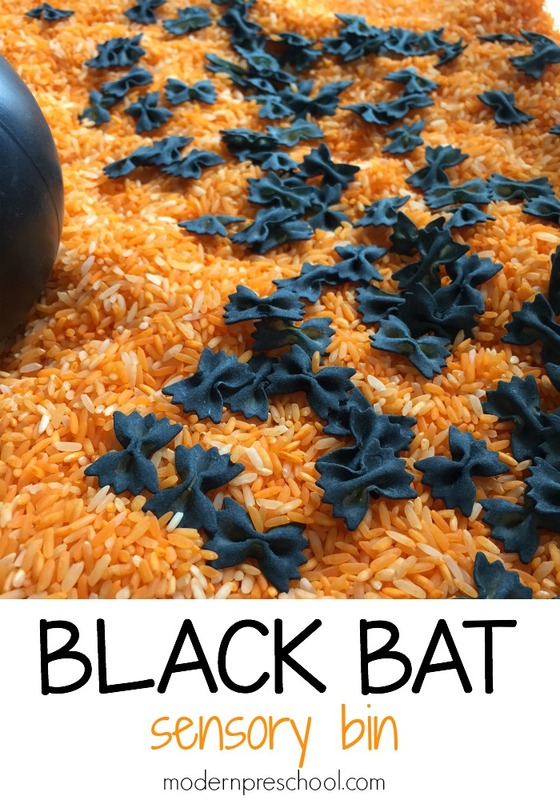 I put together our simple Black Bat Sensory Bin with just a few supplies. 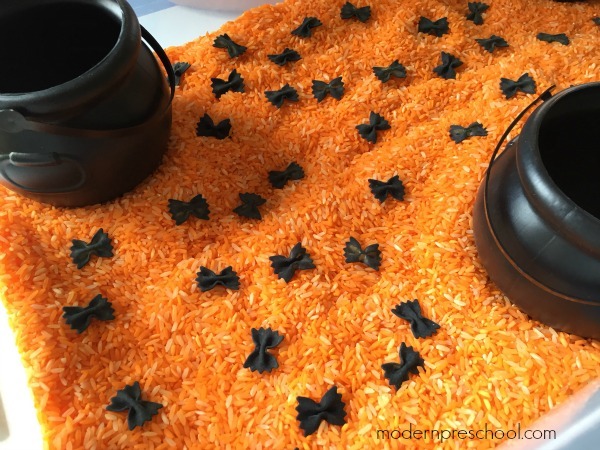 My preschoolers have been loving making bat soup, counting bats, and of course, running their hands through the rice! In my classroom the most low prep activities end up being the most fun. 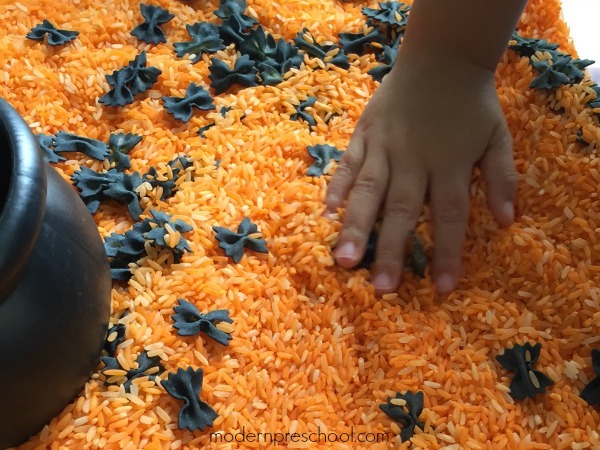 This sensory bin is no exception and has been played in by each of my preschoolers! You probably have most of the supplies on hand! To color pasta noodles or rice, I usually use a gallon freezer bag (I like these with the actual zipper). Add rice or noodles, coloring (food dye or liquid water colors), and a few drops of rubbing alcohol or vinegar. Seal the bag and move the rice around until it is completely colored. Add more coloring and rubbing alcohol if needed! 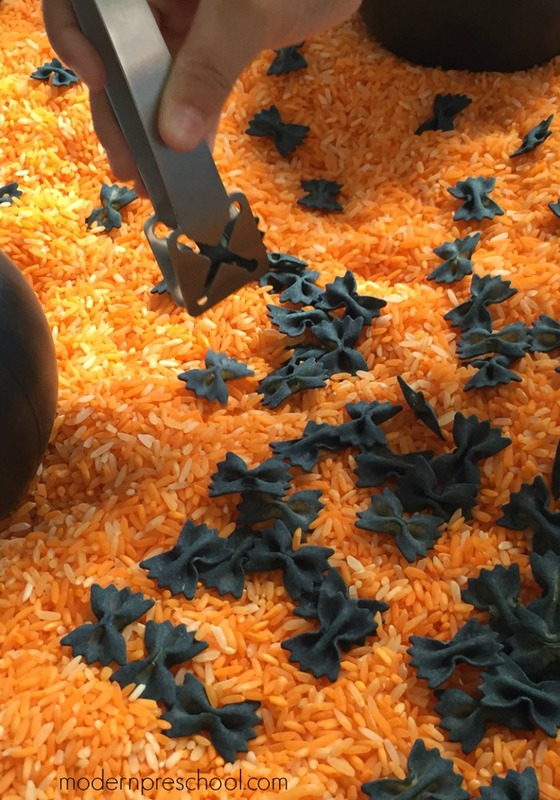 Let the rice dry by dumping it out onto a tray. For our rice and bowtie pasta noodles, I used our favorite liquid water colors. I was looking for the noodles to be black like a bat. HINT…If you don’t have access to liquid water colors, go with purple food coloring. The bats would be just as fun! When the rice and the noodles were completely dry, I added them both to our sensory bin. I love this one because the lid seals for when not in use. I scattered the black bats on the orange rice and then added 3 small cauldrons to the bin. I added kid-friendly tweezers and fun scoopers to the bin for some fine motor strengthening too! 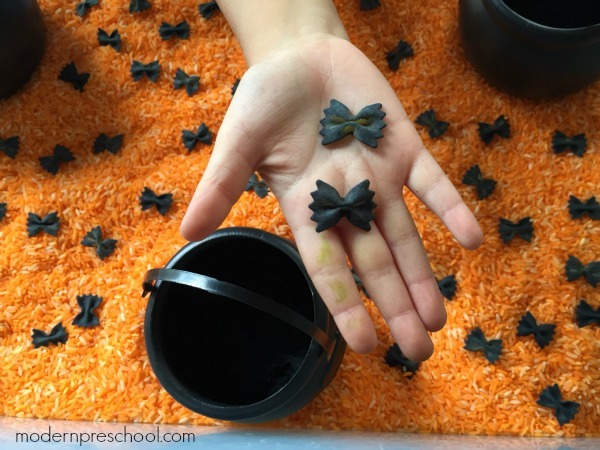 One of my favorite things about sensory play is how it promotes pretend play. My preschoolers have the best imaginations and have been serving bat soup to each other, fixing up sick and wounded bats, playing with the bat family, and singing silly songs to the bats because they just won’t fly!